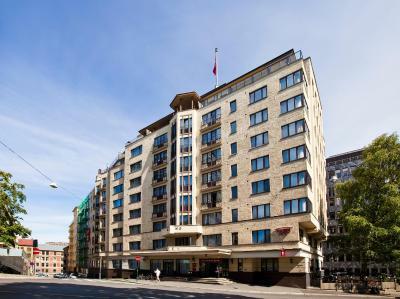 Lock in a great price for Thon Hotel Slottsparken – rated 8.7 by recent guests! Great location—-everything was walkable from the hotel. Great breakfast! Hanne was very nice during check-in—definitely the person you want as the first face people encounter when they enter your hotel. The bathroom was a good size. It didnt feel like a typical small euro bathroom. Great to have a kitchenette and separate living /dining room. The breakfast was excellent. 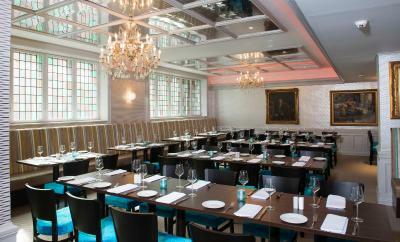 It offerred in a spacious and elegant dinning space with various selections of both hot and cold foods. The 24-hour free espresso service was especially impressive. We really enjoyed having our coffee and tea at the bright and quiet lobby. 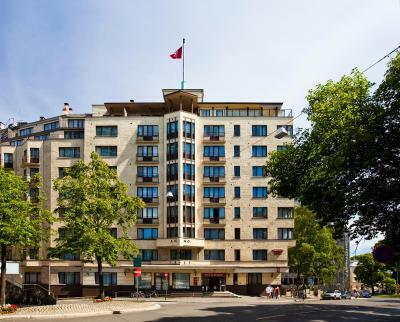 It is close to the Palace, train station and shpping area, very convenient to walk around the city. The staffs are very friendly and helpful. They serve a super nice breakfast, but be sure to get up earlier if you want to avoid it being a bit crowded - the hotel has 9 floors. 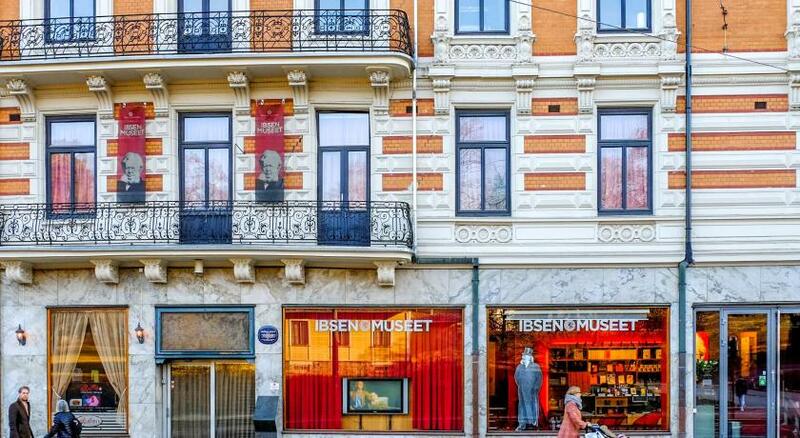 The hotel is also perfectly located for a walk in downtown Oslo. Extremely helpful and friendly staff. Let us check in early after a harrowing ordeal with the airlines on our trip to Oslo. Upgrade to apartment with 2 rooms from 1 room to swish the parking fee surprise. No asking required. The staff offered the upgrade with an apology for necessary parking taxes. The hotel staff were very pleasant and very helpful. The location of the hotel is excellent and the property is very good. Very happy with the stay. 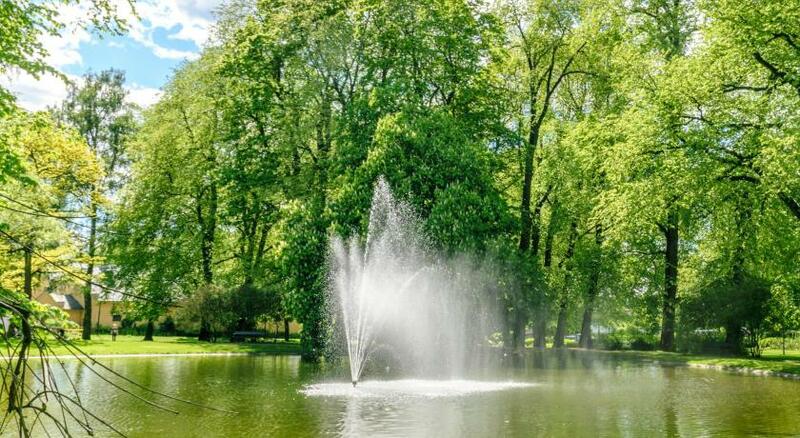 Thon Hotel Slottsparken This rating is a reflection of how the property compares to the industry standard when it comes to price, facilities and services available. It's based on a self-evaluation by the property. Use this rating to help choose your stay! 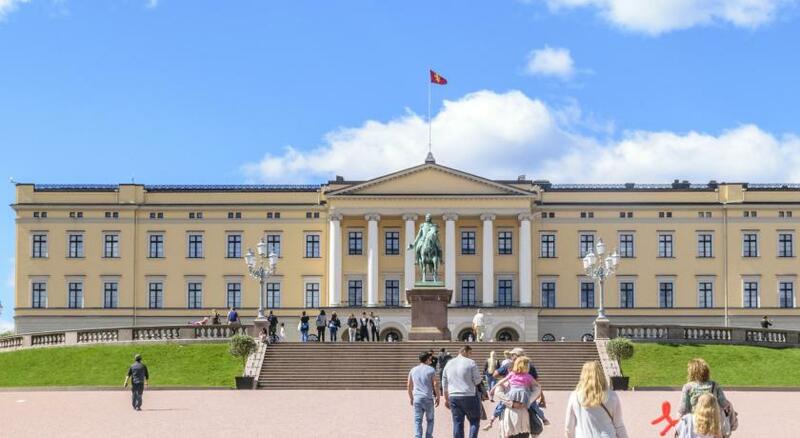 Thon Hotel Slottsparken is located next to the Royal Palace in Oslo, a 5-minute walk from Karl Johans Gate shopping street. It offers free WiFi, an on-site fitness center and rooms with a kitchenette. 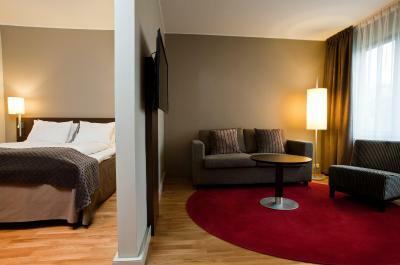 All rooms at Thon Hotel Slottsparken include a cable TV and a work desk. 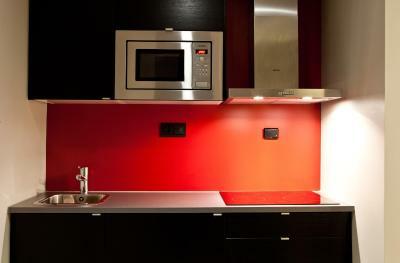 Some rooms feature microwave ovens. 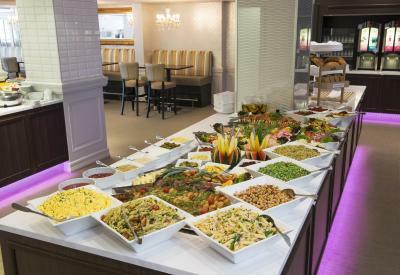 A large buffet breakfast is served every morning in the dining room. Guests can also enjoy free coffee in the lobby area at all times. The National Gallery is a 5-minute walk from the hotel, while the National Theater is 1,950 feet away. 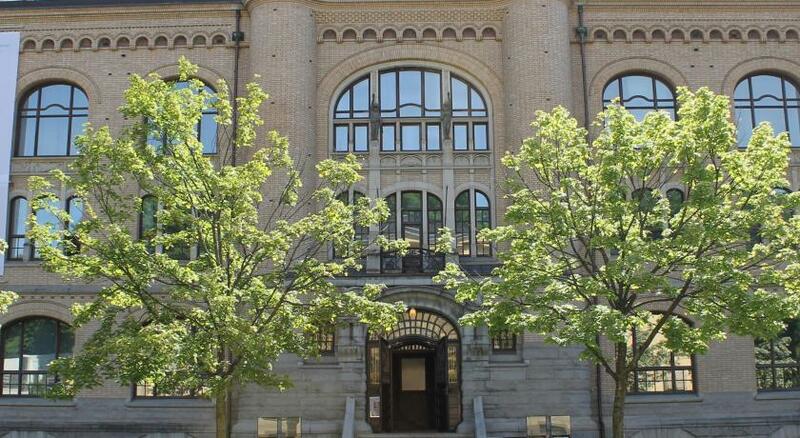 When would you like to stay at Thon Hotel Slottsparken? This double room has a seating area, microwave and coffee maker. Bathrobes and slippers add extra comfort. Private parking is available on site (reservation is not possible) and costs NOK 345 per day. This room includes a fridge, work desk and TV with cable channels. Spacious room with a seating area, fridge and a TV with cable channels. Bathrobes and slippers add extra comfort. There is space for maximum of 1 extra bed in this room. This spacious suite has a sitting area, coffee machine and TV with cable channels. Bathrobes and slippers add extra comfort. Hotel surroundings – This neighborhood is a great choice for travelers interested in parks, walking and harbors – Check location Excellent location – show map Guests loved walking around the neighborhood! House Rules Thon Hotel Slottsparken takes special requests – add in the next step! One child under 12 years is charged NOK 100 per night when using existing beds. Please notice that the hotel will collect a deposit upon arrival for guests who wish to settle their hotel bill in cash. The deposit will be paid back in full upon check out. 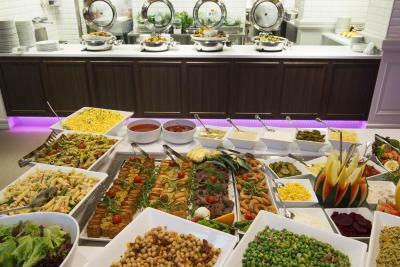 The variety of breakfast options were amazing and the food was so fresh. The room was quiet and spacious. The facilities provided were everything that we needed for a comfortable stay. The staff were very helpful and kind. They even let us check in an hour early after a long and weary trip. One of the best hotels we have stayed in. Thank you! Maybe just the all over shampoo and that there was no separate shampoo or conditioners. It just made my hair a little dry but that’s just being picky. If your sensitive to what you use on you hair just bring your own. Everything you need for a city visit. Breakfast was lovely and had an amazing choice. Staff were really friendly and helpful. We also could check out at 6 on our last day which made our last day enjoyable rather than having to worry about carrying our bags around all day. Highly recommend this hotel. No slippers for the hotel's guests?! The bed was a little to soft for me but if you like that then it is for you. The lack of a bar may be seen as a disadvantage but it did make it a quieter hotel and there’s lots nearby. We used the lounge and it’s nespresso machine and enjoyed the chance to relax in a peaceful atmosphere at the end of the day. Staff in general unfriendly. No 'good morning etc.' by breakfast staff. The girl at the reception was not helpful at all. When I asked for a map of the city, she just gave it to me with a sullen attitude. I had to ask her to mark the hotel. Again, she did it in a way that she didn't want any more questions. Very reluctant to help (Reception was not busy by the way, I was the only guest). Bathroom was new but I had never seen a smaller bathroom than that before. Shower was seperated from the rest of the tiny bathroon by a strange glass thing. It was more like a toilet where a shower looking things was added in. Location is good, within walking distance to the center. Room size is good. Breakfast variety is good. Only one of the receptionists was friendly, who provided a lot of good information to us. - tiny bathroom, cleaning in between days was more or less - in the beginning they wanted us to book an extra room for the baby of 5 months (the room has space for 4 adults, we wanted to stay there with two adults, two little children of 2 and 4 and a baby). Then they allowed us to stay in the room but didn't want to put a crib for the baby (although the room is very big). And in the end they asked us to pay something for the baby who didn't receive anything. The main bed is extremely soft. The hotel is very conveniently located near the park and in just a few minutes walk from the central streets, public transport, museums and the fjord. The room is spacious and clean. The breakfast is fantastic, with an excellent choice for any diet. Some staff were curt but others loverly. Noisy neighbours at weekends. Norway partying time with hard noisy flooring.